Chester is a city in the County of Cheshire. Lying on the River Dee and is close to the border with Wales. Chester is renowned for its many mediaeval buildings. However, some of the black-and-white buildings you would see within the city centre are actually Victorian restorations. Chester having one of the best preserved walled cities in Britain and measuring nearly 2 miles is one of the most visited cities in the Country. There are many museums in Chester and the most informative being the Grosvenor Museum which includes a collection of Roman tombstones and an art gallery. Chester Zoo can be located on the east side of the city and is the largest zoo in the UK with over 11,000 animals. In addition, there is 110 acres of award-winning gardens. 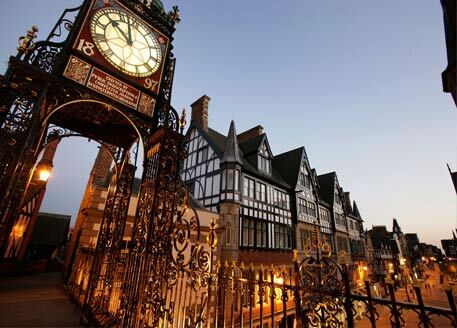 Chester is also famous for its shopping and eateries and has numerous bistro restaurants, traditional pubs, nightclubs and wine bars, some of which are based in a fantastic setting of mediaeval buildings. It’s not surprising, Chester’s main industries are now the service industries comprising tourism, retail, public administration and financial services. One of the main attractions is Chester Racecourse which hosts several flat race meetings. The races take place within view of the City walls and attract tens of thousands of visitors. There are several nationally significant races held at Chester Racecourse such as the Chester Vase, which is recognised as a trial for the Epsom Derby. Chester has good transportation links. The major road links, including the M53 motorway leading towards the Wirral Peninsula and Liverpool. The M56 motorway towards Manchester. The A55 road takes you to the North Wales coast and Holyhead. The A483 links the city to nearby Wrexham and if travelling south to Swansea. Chester railway station is called Chester General. The River Dee is home to many local and school rowing clubs. However, the main clubs being the Grosvenor Rowing Club and Royal Chester Rowing Club. The most famous race is the Chester Raft Race is held Each July on the River Dee in aid of charity. There are numerous private golf courses near the city, as well as a 9 hole municipal course at Westminster Park. However, Chester Golf Club is near the banks of the river Dee. Chester is the home to the University of Chester. Formerly a teacher training college and is the county’s main provider of tertiary education. The University of Law also has a campus in the city. West Cheshire College is a vocational college in the North West of England and has over 20,000. Chester is not just a must to visit but, a beautiful place to work and live, which makes property investment in Chester a fantastic proposition.